Written by Jane Morgan on March 22nd, 2018 April 6th, 2018 . GDPR is about accountability for how organizations use personal data. It’s about being responsible and complying with EU regulations. It’s also sensible, good business practice. This article is a set of resources to help demystifying GDPR for B2B business leaders and marketers. with a time estimate of how long you’ll need. Good For: Getting started. This 11 page overview maps out a path to GDPR compliance and good behaviour. 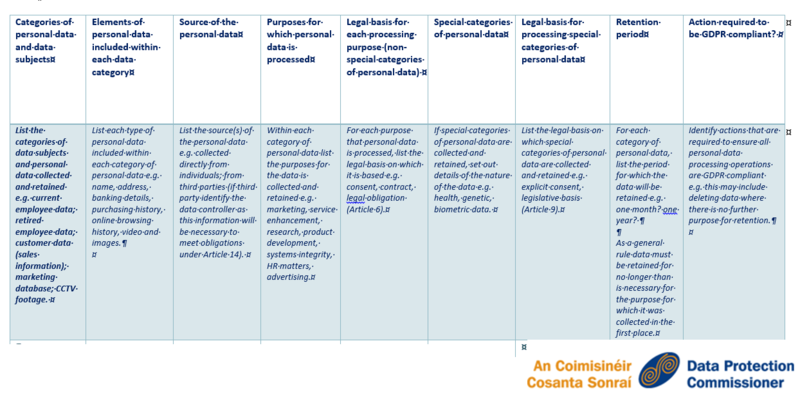 Data Source: the official Irish Data Protection Commissioner. If you prefer your own country (or language) see the bottom of this page. Summary: GDPR is about being transparent on how your organization is “using and safeguarding personal data, and … demonstrat[ing] accountability for data processing activities”. An example of personal data is: an email address collected on your website or at a tradeshow. An example of transparency is: informing website visitors how you use their information in data privacy notices such as via pop-up with ‘click to accept’ notice on your website. in a manner that ensures appropriate security for integrity and confidentiality. Data Source: McKinsey Consulting Quoting the EU Regulation, & FutureLearn. Good For: Getting grounded in the lingo. Privacy by Design: “consider privacy at the initial design stages and throughout the complete development process of new products, processes or services that involve processing personal data.” In other words, the default approach is to assume the privacy of personal data. Personal Data: “any information relating to an identified or identifiable natural person.” An example would be a photo or an someone’s email address. Data Controller: the person or organisation who decides the purposes for which, and the means by which, personal data is processed. The ‘purpose’ of processing data involves ‘why’ the personal data is processed, and the ‘means’ involves ‘how’ the data is processed. Data Processor: A person or legal organisation that processes personal data on the behalf of a data controller. Processing includes storing and transmitting data. Data Subject: A data subject is the individual to whom the personal data relates. Take Action: Become Familar With Those 5 Terms. Good For: Organizations that uses software as a service tools. The template and checklists guide to you considering where data is housed and processed. For example here is MailChimp on GDPR, SurveyMonkey on GDPR and Facebook on GDPR (used by JEM 9). In many cases these well established organizations are your best partner. For example MailChimp; keeps track of when someone subscribed or was added to the list, and also provide a mandatory easy unsubscribe option on every email you send. MailChimp – Choosing the link “Why Did I Get This?” provides the subscriber with information. Good For: Understanding the underlying principles and plenty of excellent GDPR examples for all but the largest organizations. EXCELLENT ACCESSIBLE RESOURCE!! Data Source: Suzanne Dribble, a data protection business law expert who learnt her trade at the world’s largest law firm. An alternative is the Online General GDPR Webinar and associated course by FutureLearn (designed by Faculty of Law at the University of Groningen). Good For: Placing data protection (and principles) in the marketing communications and sales context. This graphic enables you to quickly identify which teams, people and processes are likely impacted by GDPR. Good For: Non-profits and anyone else trying to get a handle on GDPR this is a wonderful resource for communicating with stakeholders in all forms. It’s an accessible document which includes a wonderfully sensible list of questions in tip 1 of their “top 10 tips”. Data Source: The Wheel is a leading support and representative body connecting community, voluntary organisations and charities across Ireland. Good For: Answering GDPR questions of online and smaller businesses. Data Source: the group is run by Suzanne Dribble, a data protection business law expert who learnt her trade at the world’s largest law firm. This group and Suzanne’s videos answer many questions; rated “hugely useful”! Good For: When your organization, via your product development and marketing communciations team for example, (i.e. you as the data controller), has an existing “relevant and appropriate relationship” with clients or prospective clients (the data subject). You may not need to reconfirm in order to communicate with data subjects. It’s about “balancing your interest and their interest”: be sensible. An example might be; making clients aware of an upgrade or improvements to a product that the data subject previously purchased from you. 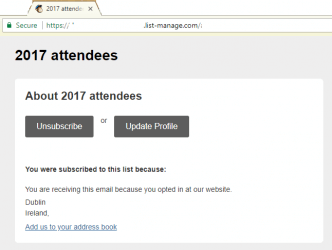 Another example might be: if someone signs up for a conference, you have a legitimate interest in providing information about that conference. Data Source: Marketing Week is a UK registered organization providing news and information for marketing, advertising and media professionals. Take Action: Learn More About Legitimate Interest For Marcom Professionals. GDPR & Fresh Consent: Do I Need To Ask Again? Take Action: Check How Personal Data Was Collected OR Get Fresh Consent. Good For: Independent researchers need to understanding how to approach and comply with GDPR when working with clients and client data. Data Source: Lesley Cooley is a qualified Data Protection Officer with experience working with Expert Independent Research Group – ICG, SMEs and Charities. Disclaimer: these resources are provided to help get you started with GDPR. Please use official sources and informed legal advice for decision making. N. B. the rules are very different for those with more than 250 employees and for sensitive personal data such as sexual orientation. So do the right thing by your customers and prospects by treating their data carefully, and use GDPR to ensure your data stays in order. For independent expert advice on better understanding customers, contact Jane.